Below is the itinerary for Ev Hales Cultural Tour and Painting Workshop in September 2015. Painting times are an approximation only. To download itinerary click here. Our private bus will pick us up at our designated hotel at 11:00am or Marconi Airport (Bologna) at 12.00pm and travel to Fiumalbo, situated in the Frignano Region of the Appenines. We arrive at the family owned Hotel in time to relax and soak in the atmosphere before having a traditional Italian home cooked dinner. Cutigliano is classified as having the most beautiful Borga (cluster of buildings) in Tuscany. It is hidden deep in the Apennine Mountains. It is surrounded by dark forests and winding roads. These quaint buildings held secret meetings by the warlords of the region in the medieval era. Our bus will take us through the scenic mountains, into the Tuscan region, along the medieval road, just like the pilgrims of yesteryear. We will visit Castel Garfagnana, a beautiful town surrounded within a castle wall, dating back to the Roman Era. After many painting/sightseeing opportunities, we then venture after lunch to a gorgeous village with red stone buildings called Sasso Rosso. There are only pathways made of stone from one house to another and we can spend an afternoon painting or exploring. If time permits, on our return we will visit San Pellegrino – the sacred sight of a travelling saint. We then travel to a medieval township nestled high in the Apennines mountains. This quiet town is just perfect for painting the old rustic fresco buildings, ancient doors and cobble pathways inside this unique township. There will be an opportunity for non painters to explore another township called Pievepelago before returning for lunch. Afterwards, you may like to walk or take the private bus to a town called Castello, to find an ancient 10AD tower and church filled with artifacts given by the crusaders to the pilgrims. Our private bus takes us down through the beautiful mountains to Lucca, a magnificent city in Tuscany. Enclosed by city defense walls, this city has narrow lanes, which meander along various medieval buildings, including an 180BC Roman amphitheatre. Learn about a prince’s love for his wife at San Michele’s Church and the history behind the town’s defense. This an opportunity to draw some stenches as you rest at a local café. On our return a stop to walk over the Madeleine Bridge build in the Matilda of Tuscany era before we return to Fuimalbo. This snow resort town set high in the forested Mt Cimone mountain. It will inspire the artists as they view the majestic castle of Sestola (900AD) which is perched on the edge of a ravine. It is in the best location to paint under lovely shady tress in a garden square ,which has an interesting fountain and is surrounded by lovely stone buildings. There is opportunity to explore the old road as it ascends to the castle and afterwards settle yourself down at the local restaurants or café for a refreshing drink and company. Today is your opportunity to paint this medieval town on the border of Tuscany and Emilia-Romagna and is surrounded by two rivers. Small narrow streets reveal a town steeped in history. Learn about the history of the whites and the reds religious sect as each protect their church and their beliefs. The landscape consists of beautiful old church, stone bridges and a Seminary Abbey. In the late afternoon, we will drive into the Valley of Rossena to Polinago to explore the Emilia side of the Apennines. Our Bus will travel to Modena, which is one of the more significant cities in Emilia-Romagna. The ancient centre will be our location to paint and explore the ancient medievel centre and variety of exclusive stores. You will be free to spend the day exploring the architecture, Este Art Gallery, library, churches and beautiful shops or follow Janette who will tell you the history. The painters will have time for their artwork even while the largest market in the region is on at the Duke of Este’s summer town called Pavullo. After lunch, our bus will bring us to the original castle of the Montecuccuoli, the lords of the Frignano area. There will be time for the artist to paint within the old square with roses and colourful gardens amongst stone houses as well as seeing the church outside of this mighty fortress. Inside the castle walls, there is a beautiful display of artwork and wonderful views. There is always time to walk within the countryside and enter the museum and explore the castle. Our private bus will take us for a short visit to the Parmeggiano Cheese Factory to appreciate their workmanship and sample their award winning cheese. Then we travel to the town of Palagano, which is located in the Valley of the Dragon surrounded with iconic buildings. Join the friendly paesani on their market day and afterwards settle to paint the beautiful scenery surrounding this township. We venture back in time, to paint a 1500AD watermill which is still working today to grind grains. This region has inspirational landscapes with views of the ancient borga of Gombola nestled on top of the mountain. After lunch we proceed with a trip up the hill (either walking or travelling by bus) to paint within this old quiet center, which has views of the magnificent mountains valleys. For the ones who wish to walk to the Borga (cluster of stone houses), there are windy pathways which lead through the countryside , in the forest, where wild mushrooms grow, streams run and wild flowers bloom. For people wanting to explore further, you can walk to the roman bridge of Brandola and meander back through the farming districts surrounded by beautiful mountains. This will be our final day in this beautiful area. This will be the day to say your farewells to the locals and complete any last minute photographing/ walking/ shopping before leaving this area until the next time. This night is a chance to celebrate our time together, the painters to demonstrate their paintings as we farewell the paesani. Our bus will travel to this hill top town and its 12th century castle. The castle was constructed by Count of Montecuccol and called the Rock. The township is clustered along the Ridge with sweeping views of the Dolo Valley and the Valley of the Dragon. The castle has a Museum dedicated to the Italian Resistance, who were instrumental in the victory over the Fascists in World War II in the region. There will also be opportunity of painting a market scene and after lunch a trip to Vitriolla to paint near the 1000AD Romanist Church called St Andrea. For the ones who wish to walk, it is a lovely stroll from Montefiorino to Vitriolla, where there are many Mestra (small private shrines), tower buildings and other ancient constructions to visit. Passing the ancient entrance of the Rocketta of Castellerano, you will discover a peaceful environment to paint and explore within the beautiful cobbled town. 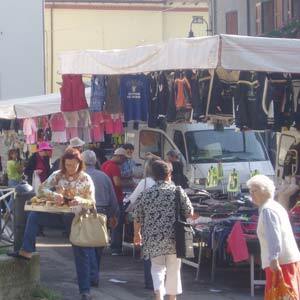 Outside the city walls there is a market, which will give you the opportunity to mix with the local people. There are wonderful scenic views from the watch tower of the town and surrounding hills. After lunch, an opportunity of painting from the shady square with views towards the lovely fortress while our non-painters have the option of an organised walk along the river before leaving to view the defense towers built during the medieval era. Departure early morning for Bologna Airport or Bologna Train Station for Venice for 3 days with Janette or other destinations.